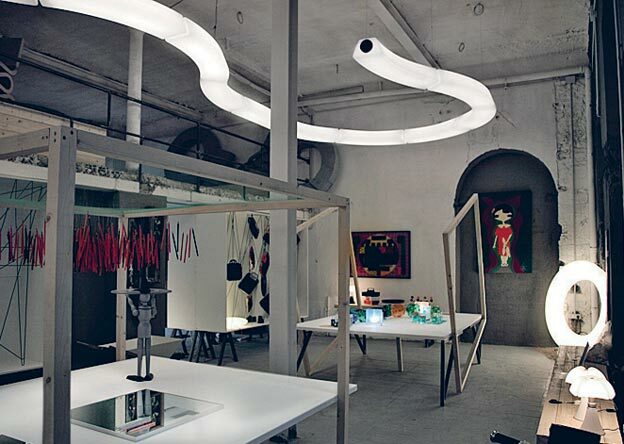 Circular Pol XXL is a project from 2013 for Martinelli Luce by Emiliana Martinelli, designer and entrepreneur, winner in 2014 of the iF Product Design Award. In a natural, enthusiastic way, Emiliana plays different roles: she manages the family company, designs many of its products, selects other designers, creates the trade fair stands and communication. With a degree from the Art Institute of Lucca, in Ceramics, and another in Industrial Design from ISIA in Florence, where she then took a degree in architecture as well, she has gained experience in the company, transforming sketches into technical drawings. “I spent time at the drawing board, but also at the potter’s wheel,” Emiliana says. She learned about the pleasure of creating, having fun by imagining new forms. “Being a businesswoman,” she confesses, “limits my freedom. I am influenced by production costs, and the market. 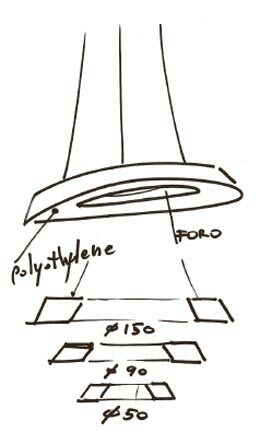 At times I break free, and then crazy things emerge.” The Circular Pol XXL suspension lamp for diffused lighting, a development of the Circular Pol model from 2009, can be seen as one of these follies. 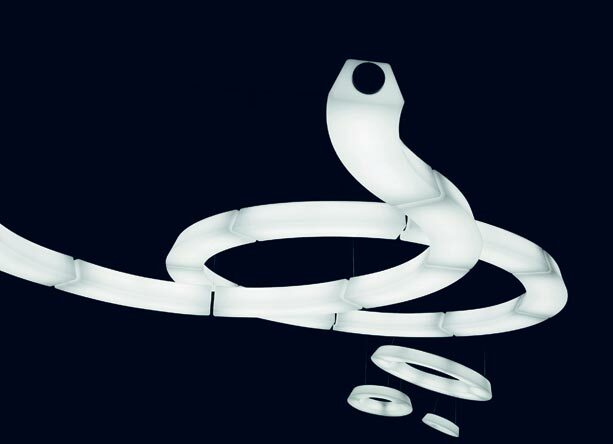 It is composed of curved and linear trapezoidal modules, in rotomoulded polyethylene, and is jointed like a serpent, forming sinuous figures that branch out freely. 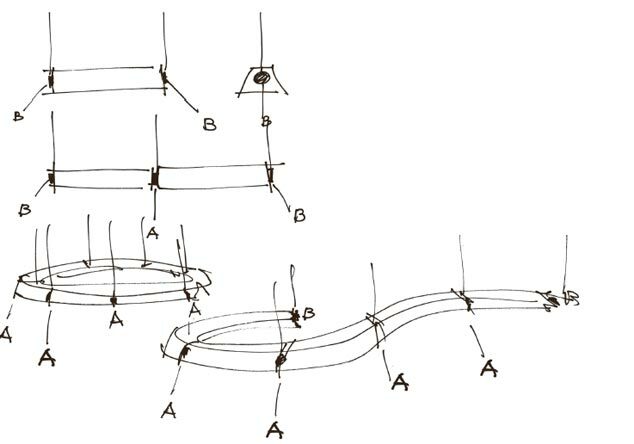 Combining 8 curved modules, you can form a circular composition with a diameter of 3.5 meters, conceived to adapt to large spaces, such as those of shopping centers, or to light up circulation routes. The modules, 1.2 meters in length, are connected by painted metal joints, intentionally emphasized to add rhythm to the composition. Suspended by means of slender steel cables, Circular Pol XXL is wired for 55W fluorescents, or with LED circuits, complete with a dimmer and power supply In its range of compositional possibilities, “you can even make a question mark,” Emiliana says, bringing out her habit of thinking about design as a sort of game. “Fun is the most important thing,” she likes to repeat. And she enjoys chasing down ideas: she feels more like a designer than an entrepreneur, a job she has found herself doing, and which forces her to fight against her creative nature, to act like a true captain of industry. This is why, as she says with good humor, “I stay in Tuscany to play with forms,” and she seems almost unaware of her talent, with which she has put together a fine catalogue of original models, like Circular Pol XXL, which seems like the geometric transformation of a cloud.